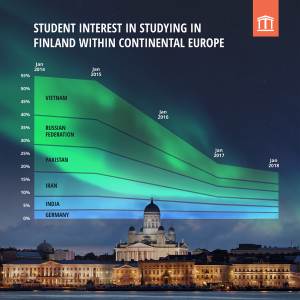 Interest in Finland from prospective non-EU students is at an ‘all-time low’ on the online student choice platform Studyportals since tuition fees were announced in 2016, but analysts say the market will inevitably recover. Tracking interest rates from students from all over the globe (except China), Studyportals analysist noticed that interest started dropping in January 2016, when the introduction of tuition fees for non-EU students was announced. “Previously, demand for English-taught courses in Finland used to be much higher than supply for Finland. “After the decision to introduce tuition fee demand dropped, and now it’s actually the first time ever there’s more supply than demand,” Studyportals’ analytics consultant Laurens Vehmeijer told The PIE News. The change is evident in all top non-EU source markets, the platform’s thought leadership manager Carmen Neghina added. In 2015, Russia, Vietnam, India, Pakistan, Germany and Iran made up almost 53% of all international student interest towards Finnish Universities. In 2016, this dropped to 36%, then 20% in 2017. It is currently just at 16%, Neghina explained. 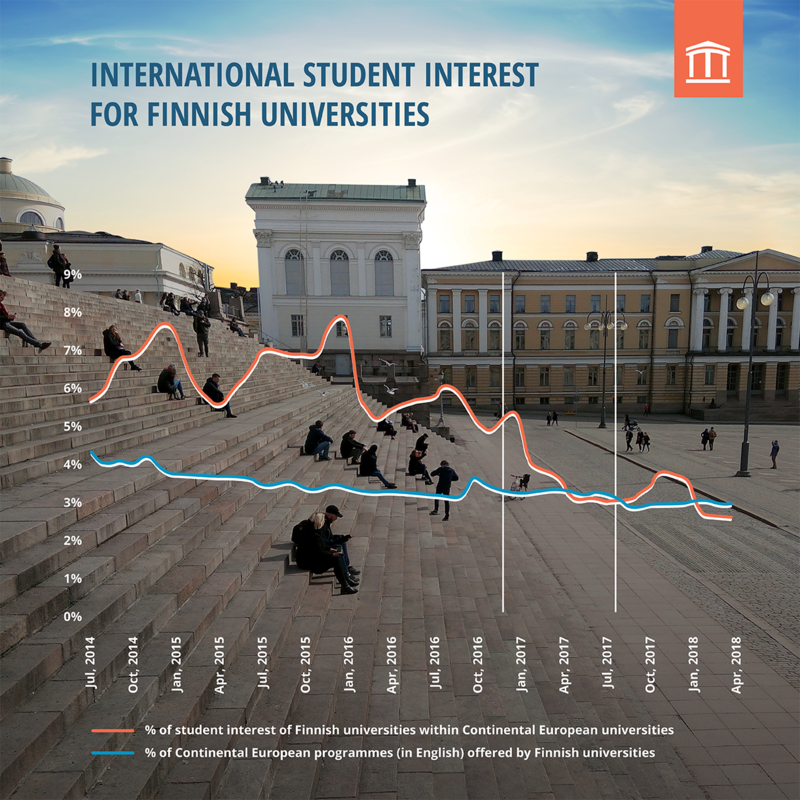 “We’ve seen a decrease in the interest of especially non-EU countries in studying in Finland, which only became more pronounced with the announcement of the introduction of tuition fees in December 2016 / January 2017 and their subsequent introduction in August 2017,” she said. Studyportals CEO Edwin Van Rest said while the drop in interest is clearly caused by the introduction of the tuition fees, other countries, such as Sweden, have experienced a similar drop in the past – and have since recovered. 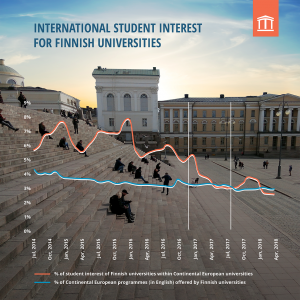 “We clearly see the recent introduction of tuition fees for Finnish universities influencing non-European students’ interest to study there, and project applications and enrolments to be affected over the next 2 years,” he explained. Neghina echoed Van Rest adding that a smart scholarship strategy is key for student interest recovery – but ultimately, Finland has its reputation as a safety net. “Finland still has great universities and is known for its teaching quality. Tuition fees don’t change that,” she said. Study.eu managing director Gerrit Bruno Blöss said that introduction of tuition fees “definitely” had an impact on universities’ recruitment efforts. “Many small and mid-sized schools have scaled back recruitment outside Europe and follow a “wait-and-see” approach,” he explained. However, he’s noticed the market is recovering after a dip in interest, with the percentage of Study.eu visitors interested in Finland on par with Sweden or Netherlands, he said. He also nodded at the well-functioning scholarship system, which he said universities have been good at promoting to students. At Aalto University, which has campuses in Espoo and Helsinki, the introduction of tuition fees has increased the share of EU applicants for their English-taught master’s degree programs. But while it had some effect on non-EU student numbers, the decrease has been “modest”, a spokesperson said. “This year, the proportion of non-EU/non-EEA applicants has risen, with 42% of applications coming from the group in 2018, compared to 37% in 2017 and 54% in 2016,” they explained.